I have blogged about how advertising statements such as “teeth in a hour” is borderline false marketing. This is due to the fact that every patient presents with different circumstances that may or may not allow for teeth in a hour. Dental implants can be utilized to replace missing teeth and immediately restored that same day if sufficient bone volume is present allowing for adequate initial stability of the implant. This treatment modality is considered a predictable and straightforward concept. In the hands of a experienced clinician and following careful case selection, immediate implant installation in an extraction socket may be a viable alternative compared to a more traditional delayed approach. 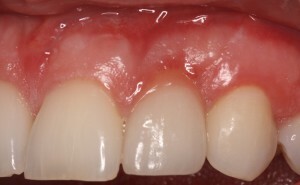 Therefore, I wanted to present a patient that I treated with a immediately loaded dental implant (teeth in a hour).